Once upon a time there was a dear little girl who was loved by everyone who looked at her called Little Red Riding Hood. No wonder NetEnt decided to bring this little girl back into the spotlights creating another enchanted video slot. 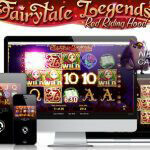 In the style of the Jack and the Beanstalk™ slot, NetEnt presents Fairytale Legends: Red Riding Hood™, another spectacular video slot that brings the good old fairy tale back to life while offering some magical video slot features such as Fairy Magic Spins, Fairy Wild Spins, Sticky Wild Re-spins, Fairy Surprise, and Bonus features including a Coin Win, Beware the Wolf Bonus, and Free Spins. You must have a heart of ice if there wasn’t at least one fairytale you liked as a child. Rich or poor, the majority of us grew up with fairytales. I personally, I loved fairytales as they made the world look like a happy place again, even if you knew there was war and poverty. Fairytales are created to bring us to a happy place where everything is possible, the reason why we probably never stop to like fairytales. 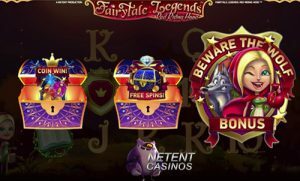 I totally understand NetEnt has chosen to create another fairytale slot while players can already enjoy Jack and the Beanstalk™ at the NetEnt Casinos, as well as video slots inspired by a fairytale such as One Thousand and One Nights (Arabian Nights™ slot), Captain Hook (Hook’s Heroes™) while Super Lucky Frog™ does offer an enchanting atmosphere, there is the Trolls™ slot, Wild Witches™, and Robin Hood™. Once upon a time there was a dear little girl who was loved by everyone who looked at her. None of them all loved her so much as her grandmother did, who, one day, gave the little girl a red riding hood. It suited her so well that she would never wear anything else after everybody started to call her Little Red Riding Hood. One day, her mother as the girl to visit her grandmother who fare ill and lived alone deep in the wood. On her way with a basket with food and a bottle of wine, she was last-minute told by her mom to not stray from the path. The girl made a promise of which she didn’t know yet that she wasn’t going to keep it. Not long after, Little Red Riding Hood met a wolf in the wood who asked her what she was up to. In good faith, she told the wolf about her granny’s bad health and where she lives. That’s when the wolf tricked her into picking some flowers to win time and run to granny’s house. The wolf entered the house and went straight to the grandmother’s bed, devoured her, and put on her clothes and cap. Finally arrived at her granny, Little Red Riding Hood was surprised to find the cottage-door standing wide open. While having such a strange feeling she went to the bed and drew back the curtains. There lay her grandmother with her cap pulled far over her face, and looking rather strange. Just when you think you’re reading world’s first fairytale with a bad ending, a huntsman came by the house and heard snoring. Seeing the wolf in granny’s bed, he guessed what happened and decided to open the wolf’s stomach with a knife. That’s how granny and Little Red Riding Hood got saved. And the wolf? He got trapped by his own greed and the huntsman filled the wolf’s stomach with stones so when he woke up, he tried to run away, but the stones were way too heavy. That’s how the wolf got what he deserved while granny and Little Red Riding Hood lived happily ever after. Don’t we all love happy endings? Especially when playing a video slot who happens to be based on the above fairytale. 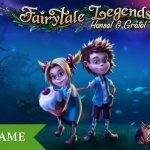 Fairytale Legends: Red Riding Hood™ won’t be available before the end of September, though, but luckily we have been spoiled with a preview video that shows what to expect from this new NetEnt video slot. Fairytale Legends: Red Riding Hood™ is going to be so much fun again and this time, you’re about to join Red Riding Hood on her journey through the forest. On the way, you’ll be enchanted by the fairy who has more surprises for you than the wolf in the fairytale. With the wave of their wands, you might end up with one of the spellbinding Random Features such as Fairy Magic Spins and Fairy Wild Spins. 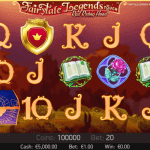 Find your way to granny’s house through the deep dark and scary forest and your courage will be rewarded big time with a coin prize that could equal up to 200 times the bet, a coin win I’ve never seen before in a video slot. 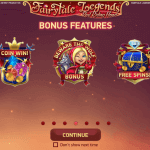 Packed with the above slot features, Fairytale Legends: Red Riding Hood™ has even more to offer as there will also be slot features such as Free Spins and Sticky Wild Re-spins. 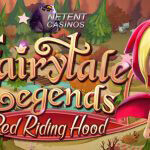 I assume players won’t be bored while playing Fairytale Legends: Red Riding Hood™ that will be available at the NetEnt Casino from the end of October. Of course, you can also look out for a mobile version better known as Fairytale Legends: Red Riding Hood Touch™.